Saturday 8th March marked the date for the annual KB 5 Road Race organised by fellow university club the Hares and Hounds. Figuring that we could give the “proper” runners a run for their money, EUTri was keen to field a strong team. The race offered a good chance to test how winter training was coming along as the road run consisted of a 5 mile route on a good surface with a number of tough uphill sections and some faster flat sections. Vincent had organised a few practise runs in the lead up to the race. With a 1pm start time we met at the usual Meadows corner and walked up together as a team. We had a good turnout with 9 racing in total plus our own event photographer (thanks Akib). The walk up to Kings Buildings was promising with the weather calm and quite warm for early March. Getting to the event with plenty of time to spare, and a hassle-free registration, we marked out an EUTri territory. It was clear turnout was good with the Haries inevitably having large numbers and their Glasgow counterparts travelling from the West with a strong contingent. Attention next turned to the warm up. Walking outside towards the start line it became clear the weather wasn't as good as initially thought; the wind hollowed and blew and threatened to make for a very challenging race. With the warm up complete we headed back inside and Yvonne produced the obligatory face paint which was duly applied (with some resistance from Vincent!) to bolster team spirit. Out onto the start line and it was time to get started. The race started inside Kings Buildings and immediately led onto Mayfield Road with a left turn into a fast first mile which was mainly downhill. So far so good with not much wind to speak of. The route then took us through some housing which again stayed mostly on the flat however was immediately followed at about 2 miles onto a tough uphill section on a bend. Now the wind started to play into things with headwinds not causing too many problems but fierce cross winds leading to some unsteady moments. The route then led onto Braids Hill Drive, that familiar Monday night route, and here most runners tried to kick on from the hilly section beforehand. The wind remained though and although now mostly a tail wind, occasional sideway gusts led to some tricky running conditions. Following the Braids Hill section (approximately 3.5 miles) there was a short downhill section which led into the final mile uphill towards KB. 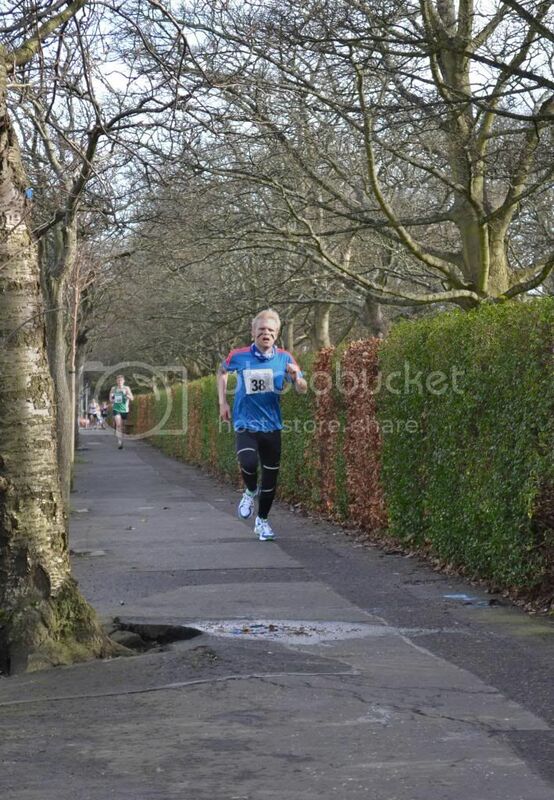 The last mile was hard going, all up hill and into the wind, with the race finishing inside KB close to the start line. Akib stood dutifully near the finish taking photos and providing a sole counter cheer to the many cheers for the Haries. Everyone competing put in strong performances with Sam Woods (26.31) and Turlough Montague (29.05) noticeably clocking up sub-30 runs. 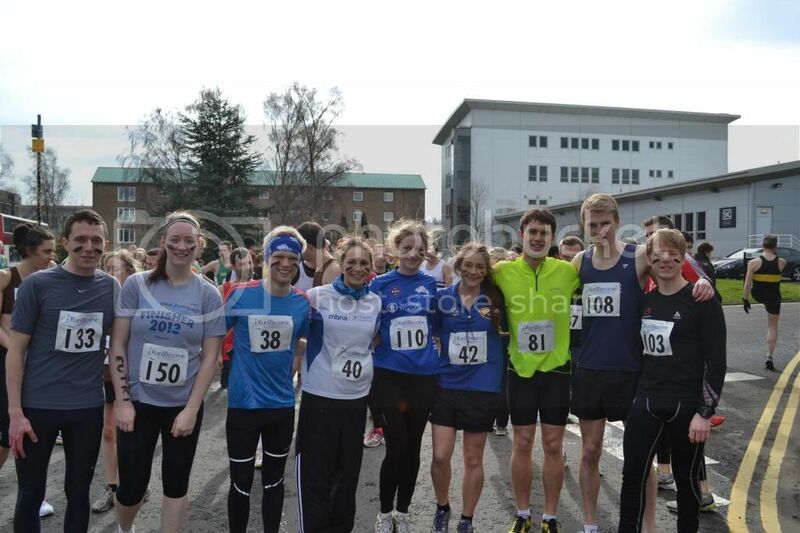 As a team we performed well with EUTri Men coming out ahead of Glasgow University Hares and Hounds. Everyone agreed it was an excellent training run and there was talk of organizing future runs on the route in the lead up to the season starting.